Following last Saturday’s 10th-round TKO loss at the hands of Floyd Mayweather, the future for UFC Lightweight Champion Conor McGregor is now up in the air. McGregor has said that he plans on fighting in MMA again, and there are rumors he could even fight before the end of 2017, but there’s also the real possibility he takes another boxing match for his next fight. There’s also a possibility that he takes a leave of absence from both sports. It’s up to McGregor as to what he wants to do next, and we’ll surely find out what his upcoming plans are in the next few weeks, after he heals up from the Mayweather fight. MMA fans won’t like this, but the most realistic option for McGregor’s next fight is a grudge match against Malignaggi. 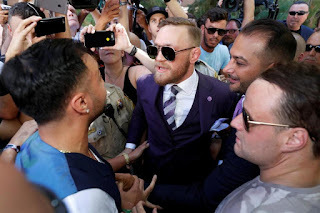 We all know the story, so there’s no need to rehash it, but briefly: Malignaggi was brought into McGregor’s camp to spar with him, photos were released of a possible knockdown during the sparring session, and Malignaggi hasn’t shut up about it since. It’s obvious Malignaggi has been planting the seeds for a potential fight with McGregor, and it’s likely McGregor’s team has also been thinking a few steps ahead as well. 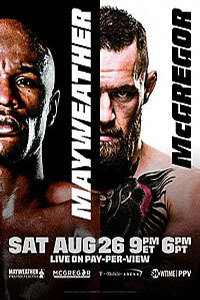 This seems like it would be a pretty big fight, and it’s also a winnable fight for McGregor in a boxing ring, as Malignaggi is an older fighter who has suffered numerous knockout losses. This could potentially be a big PPV for Showtime, and a big payday for both fighters. Plus, it seems like it’s a fight that fans want to see. Should McGregor return to MMA, the fight that makes the most sense for him is a trilogy match with Nate Diaz. 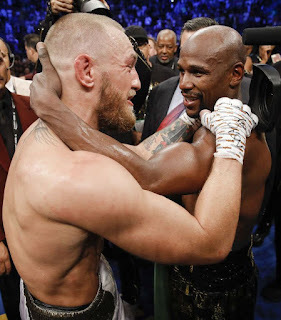 The two have met twice previously, with Diaz defeating McGregor via submission in a shocker at UFC 196, and McGregor winning a majority decision against Diaz at UFC 202, and having a third fight to settle the grudge once and for all makes sense. The first two fights did gigantic box office numbers and PPV numbers, and a trilogy match would do so as well. But after making such a massive payday boxing Mayweather, who knows if MMA money is good enough for McGregor anymore? It’s hard to say, but if the UFC can give him the money he wants, then the Diaz fight makes sense. UFC 216’s main event is an interim lightweight title bout between Tony Ferguson and Kevin Lee, and the winner of this fight could earn a fight with McGregor should the champion want to unify the belts. The problem is, neither Ferguson nor Lee is much of a draw, and it’s unlikely McGregor would be willing to take a reduced payday to fight either man. But if McGregor’s goals are to continue defending the lightweight belt and upping his legacy in MMA, then he’ll need to fight the winner of UFC 216’s main event between Ferguson and Lee. Although a trilogy fight with Nate is big, so is a grudge match against Nick Diaz. In the past McGregor has actually been quite complimentary towards Nick, praising his ability to come forward and take shots while putting on entertaining standup fights. Nick hasn’t fought in a few years now and is essentially retired, but a fight with McGregor should be enough to get him off of his couch and into a training camp. 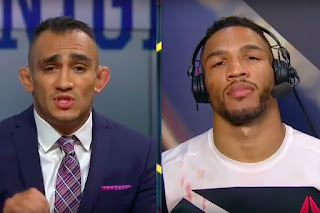 It would be a big money fight for both men, and potentially one of the most exciting stylistic matchups the UFC could make, considering the ability of both men to stand in the pocket and dish out punishment. It’s a dream fight. There’s also a very real chance that McGregor could retire, if only temporarily, and the main reason for that would be the recent birth of his son. As much as McGregor loves fighting and making millions, he clearly also loves his family, and it’s only once that you can see your son or daughter grow up. McGregor could tell the UFC (and boxing, for that matter) he wants time off to be with his family, and considering how active he’s been the last few years, it would be a well-deserved break. Then again, he may want to keep fighting and making money, so we’ll see. Whatever McGregor's next fight is, it's bound to be exciting. Between his MMA and boxing careers, the man has proven to be a legitimate crossover sporting superstar, and it's always a treat to watch him go to work inside the cage or the ring. Which of those will house "Notorious" in his next fight remains to be seen.